It is fun driving a vehicle that can get you to where you need to be without limitations. SUVs fit this description but their popularity doesn't solely rest with their physical makeup or what they have under the hood. 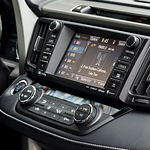 The 2018 Toyota RAV4, for instance, brings interior features to the table that make it a good option for many drivers. When you step into the 2018 RAV4, you will be greeted with features that make driving a joy. These include the heated and powered front seats that provide comfort during extended drives and warmth on those chilly nights. The RAV4 also comes with Homelink with frameless rearview mirror and power moonroof. This available system allows you to control your front gate, garage, and the security system of your home all from the comfort of your car. The is much more to learn about the 2018 Toyota RAV4. If you would like to see what else it has to offer and take one out for a test drive, then visit us at Mann Toyota.